Does the Job Perfectly: The 3-sectional set of 2 wine racks are great for displaying and storing practically any size liquor bottles, the quality iron will hold your heavy, bulky or large wine bottles without worrying a bit that it can fall and break. Endless Possibilities: Even great for storing fluffy towels, the wall rack is amazingly organizational for small space bathrooms or apartments without a spare linen closet, you will no longer get frustrated when everything is hard to find, disorganized and cluttered. Marvelous Gift Idea: The wall mountable iron wine bottle racks make the perfect gift for a housewarming or Christmas. Make someone special happy and decorate your kitchen or dining room wall with a classy and timeless piece. The Quality Wrought Iron 3-Section Wine Bottle Racks Will Help You To: Store your wine or liquor bottles where you can see to easily reach for one when you have impromptu gatherings, free-up space inside your pantry, kitchen cabinets or counter top to work more efficiently, use the iron wall racks for storing towels, baby wearing wraps, bed sheets and linens or other things that will fit with ease. 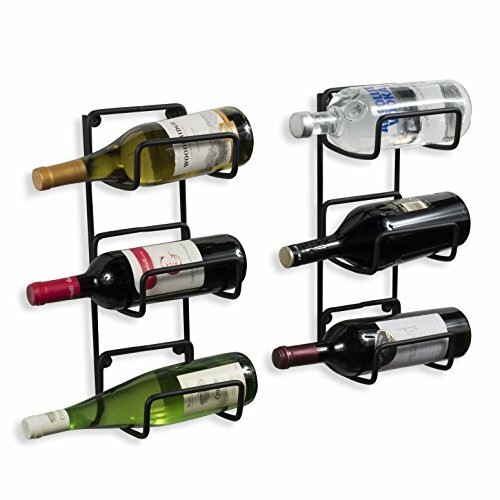 Each Wine Rack?s Dimensions: 16" x 6" Bottle Width 5 1/2"
2 8.5mm 16" Wrought Iron Wall Mountable Wine Bottle Racks with Mounting Hardware Included.